It’s like they have spidey sense or something! The moment their dad steps out the door for a business trip (or hunting trip, or guys weekend, or whatever), my kids immediately transform. The home defense team has been slashed in half. Mommy is now both quarterback and wide receiver. She is both good cop and bad cop. She is both boo-boo kisser and disciplinarian. She is now all things to her children! And those little ankle biters are bound and determined to test the defense. The kids are on a power-play (hockey term), and they know it! During the day, the kids may seem reasonable, but the moment nighttime comes, all form of reason seems to go out the door. Mom is going at it solo. Thankfully… she is not alone! While she may not be able to completely fill daddy’s shoes on her own, she has a supernatural help… a heavenly Father who can and will fill the void of dad’s absence if only she will ask Him for help! When your husband is out of town, how do you handle bedtime routines? Bedroom Play Time – We head into the bedroom after the teeth are brushed. For the next few minutes (10-20 minutes depending on how late we start bedtime) the kids are allowed to play with whatever toys are in their room. Jammies – Putting jammies on can be fun. I like to make it a game for them. I’ll hold their jammie shirts open and see how fast the kids can run their heads into the hole of their shirts. Jumping into their pants? Who says you have to put them on one leg at a time? Bedtime Story – When Daddy is gone, the kids miss him. We can remind them that they have a Heavenly Father who loves them very much! Story time can be a great time to teach our kids about how God is always with them or share a fun story to help everyone wind down. One of our new favorites is Night Night, Daddy. It’s a sweet, rhyming bedtime story that will allow children to say, “Night night,” to Daddy even when he’s away. Prayers – We can pray with our kids and encourage them to join in and pray. We can pray for Daddy, too. When we talk about him, it makes him feel near even if he’s far away! Sing a song – After the lights are shut off, I love to sing with my children. It’s sweet listening to their little voices in the still of the dark as they worship God. Daddy might be away for an extended period of time, but he doesn’t have to be absent from their lives. If possible, incorporate a bedtime phone call to wish Daddy a good night. Technology is so wonderful for making the world seem smaller when you are separated by many miles! Remember, your other half might be gone…. 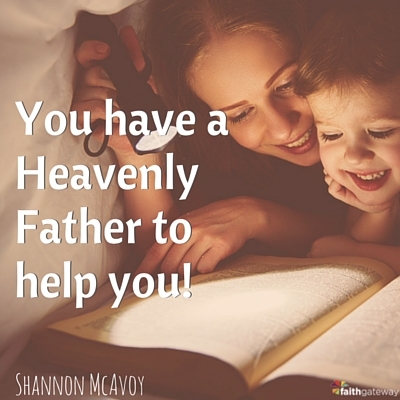 But you have a Heavenly Father to help you! Moms and dads, your kids will also love Night Night Mommy! All parents at some point have times when we have to go solo, particularly single parents (Way to go! You’re our heroes!). What are some of your bedtime routine standards to help evenings be smooth and fun?